This chapter focuses on the use of ePortfolios in the recognition of prior learning (RPL) and professional recognition (PR) within higher education contexts. The term eRPL refers to the recognition practice of utilising ePortfolios for RPL and similarly, ePR refers to the use of ePortfolios for PR. Both are relatively new phenomenon and a developing field of practice and utility. The eRecognition framework developed by Cameron (2012) is built upon to explore the utility of ePortfolios across higher education through a content analysis of papers presented at the ePortfolio and Identity Conference (ePIC) from 2008 to 2012 (n=307) and articles published in the newly established International Journal of ePortfolios from 2011 to 2013 (n=31). Harris's (2000) boundaries and boundary-work framework is applied to position eRecognition practices within the contemporary educational context and the challenges and changes being brought upon educational practices and structures through the open learning movement. The aim of this chapter is to gauge the use of ePortfolios in the recognition of prior learning (RPL) and professional recognition (PR) across higher education contexts through a content analysis of recent conference papers and an academic journal both focused on the use of ePortfolios. The term eRPL refers to the recognition practice of utilising ePortfolios for RPL and similarly, ePR refers to the use of ePortfolios for PR. Both are relatively new phenomenon and a developing field of practice across education and human resource contexts. The chapter builds upon the eRPL and ePR framework developed by Cameron (2012) to explore the utility of ePortfolios across higher education by identifying eRPL practices through a content analysis of papers presented at the ePortfolio and Identity Conference (ePIC) and articles published in the newly established International Journal of ePortfolios (IJeP). The content analysis provides a broad brush scan of eRPL and ePR activity as reported at the conference and in the journal. The International Journal of ePortfolios (IJeP) is a double blind, peer reviewed, open access journal that is published twice a year and is focused upon the practices and pedagogies related to the use of ePortfolios in educational settings. The first Issue of the Journal was in 2011. 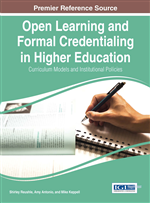 The main focus of the chapter is in relation to the different forms and contexts for the recognition of prior non-formal and informal learning and how these are operationalised in higher education contexts and for what purposes. The key objectives of the chapter are to paint the contemporary educational context in which RPL is now operating and the new forms it is taking with the aid of new technologies. Harris’s (2000) boundaries and boundary-work framework is applied to position eRecognition practices within the contemporary educational context and the challenges and changes being brought upon educational practices and structures through the open learning movement. This will be followed by a discussion of the broad definitions and terminology used internationally in relation to recognition and its purposes and contexts followed by the use of a newly developed eRecognition framework, which can assist higher education researchers and practitioners determine what type and form their use of ePortfolios for recognition needs to take. It is hoped this will foster critical pedagogy in the use of ePortfolios for recognition by providing a theoretical scaffolding by which researchers and practitioners can critique their own practices and that of others. As with the introduction and adoption of many new technologies in the field of education, there is a tendency to avoid the underlying issues and pedagogic implications that the use of these new technologies brings. This is usually accompanied by a preoccupation with coming to grips with the new technology without a deeper questioning of the educational, social and economic implications the technology brings with it.